Reigning world champions Germany have booked the best possible examination of their squad and form. Joachim Low’s men will tackle the 2010 World Cup winners Spain on home turf on Friday night, before a Tuesday night test with the brilliance of Brazil. Both fixtures are live and exclusive on BT Sport. Germany are unsurprising sitting top of the FIFA rankings courtesy of a 21-match unbeaten streak. 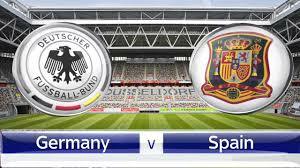 However, Spain are also still unbeaten since Julen Lopetegui took over the helm in the summer of 2016 following the European Championships, but facing the Germans is a whole different conundrum. Low’s side won all 10 matches, firing in a record 43 goals, to book their ticket for the 2018 World Cup, becoming only the second team after opponents Spain in 2010 to achieve the perfect qualification campaign. The mood in the German ranks is one oozing of positivity. They have a young generation pressing the established contingent which includes the exciting RB Leipzing striker Timo Werner and Philipp Lahm’s natural successor at Bayern Munich Joshua Kimmich. Centre back Niklas Sule has been in exemplary form at Bayern and will most likely partner Mats Hummels to attempt to shut out the plethora of attacking talent from the visitors. Atletico Madrid forward Diego Costa, recalled for the first time since June 2016, is likely to spearhead the line-up with his robust approach, allowing the trickery of David Silva, Asensio, Isco and co to sparkle. Both sides have a gluttony of squad options and this could be utilised as an experiment by the managers, but the raft of world class players will surely produce a pulsating Friday night spectacle. Low has left Manuel Neuer and Marco Reus behind to continue their rehabilitation, whilst Mario Gotze and Andre Schurrle miss out for the hosts. Premier League stars such as Mesut Ozil and Leroy Sane are likely to start the finely poised contest. However, Chelsea duo Alvaro Morata and Cesc Fabregas have been left out in the cold by the Spanish selection. Their Blues team-mate Marcos Alonso is in line for a maiden cap, but another Chelsea star Pedro will also sit out the international break, as will Manchester United playmaker Juan Mata. Real Madrid midfielder Toni Kroos struck the only goal in a victory for ‘Die Mannschaft’ in their most recent encounter in November 2014, gaining slight revenge for the 2010 World Cup semi-final defeat. The hosts boast the superior head-to-head record, prevailing in nine of their 22 matches (D6 and L7) taking on the Spanish.